Blog Home > Product Ideas > A Mirror’s a Mirror and a Sensor’s a Sensor, Right? 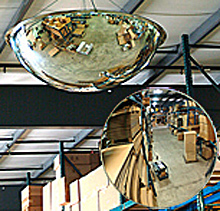 We see safety mirrors in more places than just warehouses now days. You see them in pharmacies, offices, hotels and supermarkets. They have vastly decreased the number of collisions due to blind corners and busy intersections in buildings. They also have a few drawbacks that keep them from being the total solution to collision prevention. A newer technology than safety mirrors, motion detection sensors have seen a rapid rise of use in warehouse environments. They “scan” a particular portion of the warehouse and when motion is detected within that scan range, special programming triggers various events to happen such as flashing lights or audible alerts. Highly efficient in detection abilities, they also have some ‘blind’ spots. 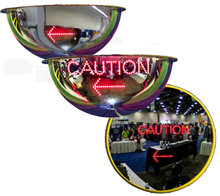 This technology combines the advantage of the wide angle visibility of safety mirrors with the scanning technology of motion sensors, resulting in an effective hybrid device with all the pluses of both technologies. Additionally, they have a higher ‘respect’ rate than sensors alone because sensor mirrors are selective in their detection schema. That means users may not consider them ‘background’ and disregard them. They may not disregard the warning if it’s issued less frequently. So, now you know what works and in which situations. Assess your facility and consider which technology will serve you best. 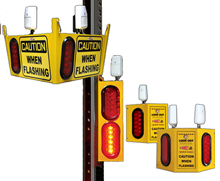 Typically, a mixture of these technologies will provide a comprehensive pedestrian/forklift safety solution. It’s not one size fits all.